For this 1st of May, International Workers Day, we send you a message of solidarity with all the militants of the workers’ movement in Turkey, a movement which, with the worsening of the dictatorial regime of the AKP, suffers a much harder repression today, this year 2016, that during the last years. We feel even more in solidarity with your fight, and even more concerned by the necessity to make it known in France, because of the fact that our government, leaded by the so-called “socialist” Hollande, is, on his side, in complete solidarity with the Erdogan’s government. He turns blind eye to the war against the Kurdish people that the Turkish government started once more since almost one year. And turns blind eye to the repression that hits the workers’ movement in your country, because this repression allows the big French companies, as the car builder Renault, to exploit in Turkey the labour force of workers paid with very low wages. One year ago, the strike of the workers of the Renault’s car factory in Bursa comforted us and gave us a good example of combativeness, which, in fact, was more or less missing here, in France. This strike gave us the occasion to explain here, in the car plants, that the workers of western Europe have nothing to fear from the so-called “economical competition” that would be for them the setting up of Renault’s factories or Bosch’s factories or others in Turkey, in Morocco or elsewhere. Quite the reverse: with such news plants throughout the world, we win new allies, thousands of new fellow workers to fight together against our bosses. And even if, today, with the help of Erdogan’s police, Renault took, for the moment, its revenge on the strikers of Bursa, we know that the fights, last year in Turkey, of the workers of Renault, as well as of the workers of Bosch and many other industrial plants is just a beginning. 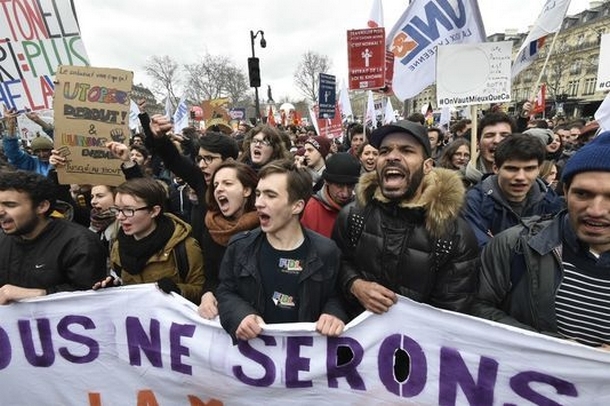 Here, in France, the new attack of the bosses and the government against the workers is a new law aimed at the reduction of the rights of the workers, at the facilitating of firing of workers, at the increase of jobs insecurity. It gave rise, these last weeks, to some vigorous responses, demonstrations of the youth, days of strike and commune demonstrations of students and workers. Till now his response is not as strong as it would be necessary to oblige the government to retreat. And the national leaderships of the unions curb the movement instead of organizing it, so that not to bother too much a government which is called “socialist” and with which they are more or less friends. In France, the situation of the workers is, of course, less hard than the one of the workers of Turkey. But, even if it is at a different and lower scale, the attacks against the rights of the workers are following the same way than the attacks you already suffered some years ago, to allow the bosses to increase flexibility and job insecurity. The workers have the same interests to defend, and, with the actual globalization, it’s more and more against the same bosses.